Is The Google Toolbar Add-ons For Firefox In The Internet For Real? In the announcement post which dates back to the 17th of July 2011, Google makes it clear that they deeply appreciate all their loyal users who use the add-ons on Firefox and also their feedback, they also states that the reason why they are discontinuing is is because of the tremendous innovation which is taking place in Firefox where most of the features offer by the Google Toolbar is being built-in to the browser. 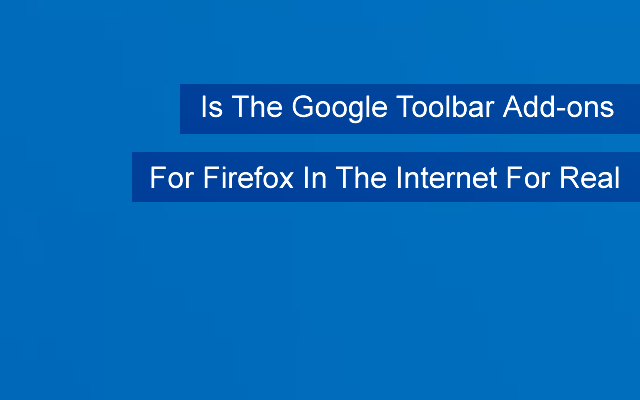 Whether or not, many of the search operators enjoy using the Google Toolbar is being built-in into Firefox browser, they did not say, but what they did point out is the fact that Google Toolbar ended with the 4th version of the Firefox browser, and as at the time of this post, Firefox browser is in it's 47th version. So technically, there really is no official Google Toolbar add-ons for Firefox. So anyone you see online that claims to work with your Firefox browser which is not the 4th version of Firefox or earlier is not official. Whether it is for real, we cannot say, but what we do know is that you should be very careful with such add-ons, because they might just be virus in disguise. So be very careful.